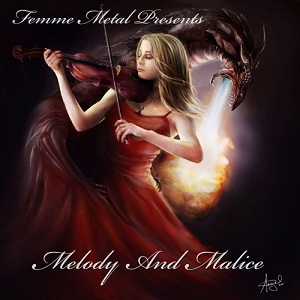 "Melody and Malice" is the fourth (and final) compilation album released by the UK's Femme Metal Records. As with previous releases the album is aimed at making money for charity - the charity being helped here is the NSPCC (National Society for the Prevention of Cruelty to Children), so its a great cuase, but the question is whether or not the album is good too. The short answer is yes it is. This is a great compilation of songs by female fronted bands from around the world. Firstly you have songs by big name bands - Arch Enemy, Lacuna Coil & In this moment, songs by established but smaller bands including Amberian Dawn, Sarah Jezebel Deva and Kittie, and songs by smaller up and coming bands. The songs are not all the same style of music - the only real common factor is the female vocals, but the tracks include Thrash, Punk, symphonic metal, Dark melodic metal and more. This diversity is refreshing and means the album has something for everyone. For me one of the best things about this album (apart from the fact its helping a great cause) is the chance to hear such a wide range of bands with minimal expense. There are some great tracks on here from bands I hadnt come across before so that's a great result for me, and this album is one I intend to listen to a lot over the coming days/weeks. This is definitely a great compilation album and is strongly recommended for fans of any of the bands included. Two discs of great music plus the pleasant feeling of knowing your money has gone to a good cause is a combination that cant be beaten. The album will be available to pre order from the Femme Metal Store on the 8th August and from all good UK retailers on the 26th September.